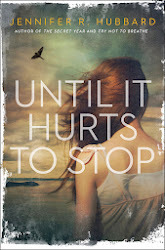 Jennifer R. Hubbard: Reviews etc. This page discusses my books in more depth, including reviews, awards, and summaries. For ISBNs and ordering information, go here. Synopsis: Seventeen-year-old Colt has been sneaking out at night to meet Julia, a girl from an upper-class neighborhood unlike his own. They’ve never told anyone else about their relationship: not their family or friends, and especially not Julia’s boyfriend. 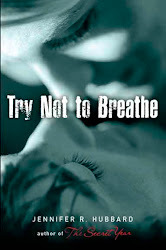 When Julia dies suddenly, Colt tries to cope with her death while pretending that he never even knew her. He discovers a journal Julia left behind. 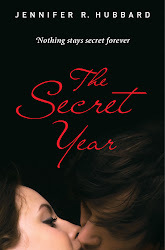 But Colt is not prepared for the truths he discovers about their intense relationship, nor to pay the price for the secrets he’s kept. Synopsis: Learning to live is more than just choosing not to die, as sixteen-year-old Ryan discovers in the year following his suicide attempt. Despite his mother’s anxious hovering and the rumors at school, he’s trying to forget the darkness from which he has escaped. But it doesn’t help that he’s still hiding guilty secrets, or that he longs for a girl who may not return his feelings. Then he befriends Nicki, who is using psychics to seek contact with her dead father. This unlikely friendship thaws Ryan to the point where he can face the worst in himself. He and Nicki confide in one another the things they never thought they’d tell anyone—but their confessions are trickier than they seem, and the fallout tests the bound of friendship and forgiveness. Available in German-language translation as Atme Nicht. Synopsis: In junior high, Maggie was an outcast, bullied by her classmates. Then her chief tormentor moved away, and high school proved to be less brutal, although Maggie has never truly let her guard down. She only finds peace when hiking in the mountains—with a friend who may be turning into more. But just when Maggie thinks she can move beyond her fears and her sense of worthlessness, her old enemy returns to town. Synopsis: Sometimes the most difficult part of writing is not coming up with a plot or the perfect turn of phrase. It’s getting motivated to sit down and start, or having the confidence to go forward, or finding the courage to move past the sting of rejection. Loner in the Garret: A Writer’s Companion provides inspiration and encouragement for that mental and emotional journey. Covering topics as varied as procrastination, the inner critic, fear, distractions, envy, rejection, joy, and playfulness, it charts the ups and downs of the writing life with honesty, gentle suggestions, and a dash of humor.